Herb Silverstein (pno); Jeff Rupert (ten); Marty Morrell (dms); LaRue Nickelson (gtr); Michael Ross (bs). On a day when I'm listening to CDs, grimacing and wondering which of my sidekicks I can palm this one or that one off on, midway through the pile, I hit on this one - a gem! 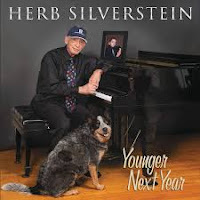 Dr. Herb Silverstein is a renowned American ear surgeon, inventor and philanthropist. His CV also states that he's the founder and president of the Silverstein Institute and the Ear Research Foundation in Sarasota, Florida. He's also an author, a composer and - a jazz musician! This sounds a bit like he's a Jack of all Trades - brought up glued to the family Steinway. Amazingly, after his sons introduced him to the music of Chick Corea and Herbie Hancock he decided to learn the piano! Probably in his '40s/'50s at the time. his intellect enabled him to grasp chord changes and patterns and now he's a highly regarded jazz composer and pianist. I'd gamble he's tops in the ear game too. The highest compliment in the jazz world is to say that he/she's got ears - Silverstein's got 'em! Not a virtuoso pianist, but a very inventive one who slots in perfectly with his colleagues. Rupert is superb on tenor (he's heard Getz) and Nickelson is up there with him. The tunes are amazing. My first thought was, why aren't these numbers part of the standard jazz repertoire or, if they had words, the GASbook?